Finally got my UltraHDMI soldered and working. PSA: Always be sure to put the Expansion or Jumper pak back in before wondering why the UltraHDMI seems to be working fine, but you get no picture on the screen. That used to trip me up pretty bad. If it happens now, I usually figure it out before wasting too much time. Thank you! I'm all set now. I'm not all that pleased with my case work, but I think it's not bad for only having a multitool file on hand. In retrospect (from a self-proclaimed non-expert at this), the soldering was pretty easy. Certainly not as easy as anything through-hole, and the pins seem much tinier in person compared to the blown-up images you see on the internet; but, with the recommended flux and solder, a nice Hakko iron (I bought an FX-888D a few years back), and a set of angled tweezers, it was straightforward to tack down the flex cable and do the drag soldering. Honestly, the case cutting took way longer than getting the cables soldered. Now to wait till round 3 to get another for this second N64 I picked up recently, assuming it works. Question, though: Is it normal to have audio hiss through the UltraHDMI when using an EverDrive 64 v3? It only seems to happen when I'm in the ED64 menu. Once I've booted a game, like Top Gear Rally (which does have some audio crackle, but I think that's just the game), it seems to go away once it starts playing the music, and it goes dead silent when I get to a save dialog, like it should. It’s very *cringe* but I uploaded it anyway since I ended up making two follow-up videos, one where I salvage a defective cable and one where I repeat the installation with a microscope for the viewers’ sake. I sold my Stone Age Gamer Ultra ED64 v3 Deluxe last year when I realized that I didn’t want to put the expensive one through the rigors of testing hundreds of consoles, but I’ll pay close attention next time I fire up my standard Krilzz ED64 v2.5. The ED64 has 480i and 240p menu options. Does it do this with both? Press Z to get the options menu to switch. I know I’ve heard pops when it resets to start a game and such but I can’t recall hearing a buzz except when using analog outputs. I know that the ED64 wasn’t programmed with standard devkit libraries since the menu goes nuts with no controller so I imagine that could create a buzz of some kind. I’ll try it on my v2.5 and let you know! Congrats on your successful installation, BTW. I've had several requests from people interested in joining the next round, including a surge of requests today. I'll try to get round 3 started tonight! I've was too busy to update the thread for a while. We finished all of them quite a while back except for tacoguy64 and Quaze. quaze sent an immaculate N64 from Canada that arrived with a couple cracks and chips, so he doesn't want the mod installed in that system and is sending another. I've seen a few standard black N64s with plastic that is far more brittle than other N64s. This is definitely one of them. jedegr and everau these two international packages (kit-only) were returned without a real explanation. Postal employees weren't sure why. I sent jedegr's back to him again with a slightly higher rate and it reached him just fine. everau opted to cancel his order. A few people had asked me to let them know if anyone backs out from round 2, so everau's kit went to "joek" on NintendoAge. joek sent us his console, so we already upgraded his system and sent it back. Started this round early to include some people who were excluded from round 3. CZroe and I are ready to start round 3. We'll just handle it through the forum the same way as before. We might also create a Facebook group. I hope to launch WeStillPlay.com sometime in 2018, but I still haven't actually built a site. Working as a team, my twin brother (CZroe) and I have performed well over 100 UltraHDMI installs and many Hi-Def NES installs. 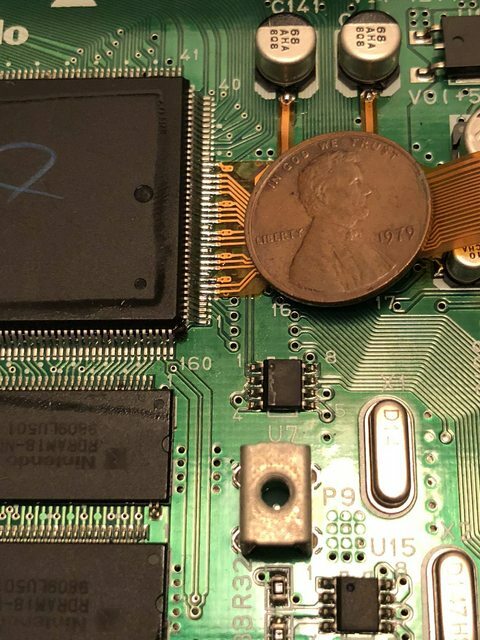 N64 fans are still desperate for UltraHDMI. With each group-buy, we hope to satisfy another chunk of UltraHDMI demand. I don’t want to exclude anyone. If you're part of a local retro gaming group on Facebook or another forum, let them know. Let's try to get as many participants as possible this week and I'll order the kits direct from RetroActive.be in 1 week. In a chat with UltraHDMI creator Marshall H, he told me: "Turn time is 5 weeks." It should be within 7 weeks if we consider all the shipping around. I’ll pass along any updates I get from RetroActive during the process. Until the order is sent, participants can back out and I will refund ASAP. If you mess up your self-install: Another flat cable is $10. CZroe has successfully restored a few failed installation attempts that were sent to him (100% success so far). If you're ordering multiples, you can save on shipping. At least four kits with extras can fit into a USPS small flat rate box. Two N64 consoles with extras will fit into a USPS medium flat rate box (no power adapter or controller). I ship from Newnan, GA 30263 (United States). Each kit is insured @$150 and each upgraded console will be insured @$250. Signature confirmation required. I can also try to obtain an N64 locally to pass on at-cost so it will not be necessary to ship a console internationally both ways. In-game reset feature: Allows you to reset the system with a button combination. Older UltraHDMI installs cannot get IGR by simply updating to 1.06+ fw. An internal wire must connect to the reset button. Each UltraHDMI kit or installed system will be tested before packing and shipping. The latest firmware will be installed (currently 1.07A). If you order a kit with no install, it will be shipped as soon as I receive and test them. If you get install service, I’ll process the list of participants in order from first to last. For installs, send only the console. I don’t need the controller, power supply, or anything else. If I receive your N64 before the kits arrive, I will have it prepped and ready. If RetroActive can send the flat cables first, I might even have the soldering part done before the UltraHDMI boards arrive. After performing dozens of these installs, I am confident I can install / test / pack / ship 5 systems per day. Shoot me a PM or email . Tell me if you’re interested in kit+install or just the kit. Tell me your name and return address. I will provide my mobile phone number, street address, and email. Make sure you're looking at the "Round 3" tab. The group buy is open until I submit the order next week. Then I will post each status update in this thread. If anyone hasn't paid at least $130 for the kit at the time an order is submitted, I'll move you to the next order. IF YOU DON'T GET IN ON ROUND 3 BEFORE THE ORDER IS SUBMITTED: Contact me anyway! I'll put you on the list for the next round. Last edited by Ichinisan on Mon Oct 15, 2018 3:44 am, edited 6 times in total. Thanks, everyone! I submitted order to RetroActive for 25 UltraHDMI kits and 3 extra flat cables. I'll pass along any updates I receive. Several people were waiting for me to tell them when this round began. I didn't realize that my message wasn't sent to some of you until earlier today. I'll start round 4 very soon, so you'll have another chance! Just posting to say I was in Round 2 and am very happy with the console. The mod is extremely clean and feels like it could have been stock. Ichinisan and CZroe are running a great service here and I'm really grateful I was able to get one. Everyone: Marshall of RetroActive is working on firmware update 1.08 and wants to finish it before shipping any more kits. It should fix a RAM timing issue that caused graphical artifacts on a small number of boards. He mentioned that some boards arrive Monday (tomorrow), but he won't be shipping anything until firmware 1.08 is ready. I believe this production run includes the HUGE order for Game-Tech.US from several months ago, so Marshall will probably prioritize that order when he starts programming and validating the boards. Marshall will probably ask me to test the new firmware and send it to someone from the previous round who was affected by the RAM timing issue. Great to see you guys are still doing this. If there's a Round 4 I'll try to get in. Funds are tight right now unfortunately. I've added you to the list so you'll know when we start another. I believe now is a good time to send your N64 if you are getting install service. I will try to contact each participant that has opted for installation. Marshall H received an order of kits over a week ago. I tested a few builds of firmware 1.08 and Marshall H fixed a few bugs. Now he has started to program the boards with the new firmware. Though he never actually confirmed for me that our order will come from this production, I believe it will (based on past experiences). He will probably prioritize the GameTechUS order since it was placed a long time ago. Since I accidentally excluded some people from this round, I will hurry up and do a "round 4." Maybe the order for round 4 will also be filled without waiting for another production run. I tested a few builds of firmware 1.08 and Marshall H fixed a few bugs. Now he has started to program the boards with the new firmware. Out of curiosity, how do those of us with older firmwares get the new one? I know Bob from RetroRGB keeps a link to the latest version on his website, but I have yet to find any kind of index, and I have yet to find where, precisely, the firmware changelog PDF in my Google search results is linked from. Installers have access to a special page on RetroActive.be which has the changelog link, and a link to the latest firmware. The page hasn't been updated with 1.08 yet. Some people were left out from round 3 because I failed to send notifications to some who were waiting, so this "round 4" is really more like "3.5" if you want to think of it that way. Marshall H is preparing a batch of UltraHDMI kits he recently received. He sent me a few builds of firmware 1.08 while he worked out some bugs and now he's programming them with the new firmware. The Game-Tech.US preorders will come from this production run and would probably have priority. Our round 1 order was placed with similar timing and Marshall had extra kits on-hand after filling the Game-Tech.US preorders. There's a very good chance he'll have enough kits left over for our order and we might not have to wait for a full production run. I hope to launch WeStillPlay.com sometime in 2018, but I still haven't actually built a site. I'll keep organizing group-buys until I get something set up. With each group-buy, we hope to satisfy another chunk of UltraHDMI demand. I don’t want to exclude anyone. If you're part of a local retro gaming group on Facebook or another forum, let them know. Let's try to get as many participants as possible this week and I'll order the kits direct from RetroActive.be in 1 week. In a past chat with UltraHDMI creator Marshall H, he told me: "Turn time is 5 weeks." It should be within 7 weeks if we consider all the shipping around. I’ll pass along any updates I get from RetroActive during the process. Until the order is sent, participants can back out and I will refund ASAP. Make sure you're looking at the "Round 4" tab. IF YOU DON'T GET IN ON ROUND 4 BEFORE THE ORDER IS SUBMITTED: Contact me anyway! I'll put you on the list for the next round. Last edited by Ichinisan on Fri Oct 26, 2018 10:44 pm, edited 2 times in total. I just received a shipping confirmation for the round3 group-buy order! The kits should reach me in a few days! When they get here, I will arrange them by serial number and test each one on video, then I'll send the kits to folks who ordered kit-only, then I'll install any N64s I have received from group-buy participants. I've sent you some PMs that haven't been opened yet. Round 4 is currently open to new participants until I submit the order to RetroActive on Monday 10/15. 25 kits just arrived (yes, even though it's Sunday). I tested each one with the jumixbx's N64 (the only system I've received so far). All of these passed the self-test and work great! If you ordered kits without installation and haven't paid the return shipping fee yet, please go ahead and do so now. I want to ship as many as possible when I visit the USPS after-hours drop box later today. These are packed-up and ready to go. The after-hours drop box at my local USPS is full, so I'll hand these over the counter first thing tomorrow. There's still time to join. Right up until I submit the order to RetroActive some time tomorrow (Monday October 15). If you know anyone who is looking for UltraHDMI, let them know! Received two N64 today from chack8. Both are installed, tested, and packed. I will take them to the post office tonight. Still expecting N64s from Operative09 and VmprHntrD. I believe both of them are on the way to me. I had already sent a message to Marshall asking to buy some kits when I got a last-minute payment. He hasn't responded yet, so anyone joining right now is cutting it really close! I contacted RetroActive to submit the order. Marshall typically activates a temporary URL for me to place the order, but he hasn't responded to me yet. I will update all participants when the order has been submitted. In the meantime, I've had a few participants join after the original deadline. It's not "too late" until the order is submitted. UltraHDMI group-buy round 4 update: 14 kits ordered! I was anxious for a bit because Marshall went silent for a few days immediately after I contacted him to buy kits. I was finally able to reach him today and ordered 14 kits. VmprHntrD's N64 is delivered. I received Operative09's N64 yesterday and shipped it out this morning. Round 3 is a wrap! You're on the list for Round 5. I will let you know when it starts! Is private message via Shmups the best way to reach you? Hopefully you get email alerts. Strangely, I received the notice of your reply to this thread only 3 hours ago. Each day since round 4 ended, I have received multiple requests from people asking to join the next one. Many are from Reddit users discovering the group-buy since I posted there in the final hours of round 4. Some Redditors immediately joined (welcome!) and we submitted that order 10/19. We'll go ahead and start round 5. The only significant change this time: Instead of setting a hard date / deadline, we'll set a target number of 40 kits. Based on the number of messages I've received in the last couple weeks, there's a chance we might reach the goal too quickly. We'll keep it open for at least 1 week so people will have a chance to find it. I have also added the option for a color-changing LED. After merging the 4 existing threads from previous rounds, the OP reverted to the original text from Round 1. I hope I haven't mangled anything while editing it. Working as a team, my twin brother (CZroe) and I have performed 200+ UltraHDMI installs and many Hi-Def NES installs. N64 fans are still desperate for UltraHDMI and frustrated because there hasn't been an easy way to get in line for one. When people were getting income tax refunds earlier this year, 3 of my eBay auctions in a row sold for over $1,000 (we start each auction at $0.01). I hope these group-buys help to satisfy a huge chunk of UltraHDMI demand. I don’t want to exclude anyone. If you're part of a local retro gaming group on Facebook or another forum, let them know. We will accept as many participants as possible until I submit the order to RetroActive. In a chat with UltraHDMI creator Marshall H, he told me: "Turn time is 5 weeks." I'd expect closer to 7 weeks if we consider all the shipping around. I’ll pass along any updates I get from RetroActive during the process. Until the order is sent to Marshall, participants can back out and I will refund ASAP. I ship from Newnan, GA 30263 (United States). For shipping outside USA, I will contact you before kits are ordered to work out the cost of shipping. Shipping for multiple kits or consoles can be combined. A round 3 participant ordered 15 kits and they fit easily into a small flat-rate box. I typically purchase insurance and require signature confirmation, so I will have to calculate the cost of a combined shipment. Custom power LED color: Choose green, blue, yellow, white, color-changing, or original red. Each UltraHDMI kit will be tested when I receive them. Each N64 system will be tested as I receive it. Each upgraded system will be tested again before packing and shipping. The latest firmware will be installed (currently 1.08). If you order a kit with no install, your order will be shipped as soon as I receive and test them (I use the after-hours drop box if the post office is closed). If you’re getting install service, I’ll prioritize and process the list of participants in order based on when I received payment of at least $130 for the kit. For installs, send only the console. I don’t need the controller, power supply, or anything else. I'll have some of the N64 systems prepped and ready for installation so I can begin installs as soon as the kits arrive. I am confident we can install / test / pack / ship 5 systems per day. I have a few extra flat cables, so CZroe can perform the soldering work for some of these systems before the UltraHDMI kits arrive. White, green, blue, yellow, color-changing, or keep it red. Post subject: UltraHDMI group-buy round 4 update: Shipping confirmation! I got a shipping confirmation from RetroActive around 9:30 PM Eastern last night! This is for ROUND 4 (14 units). I updated each participant last night, but neglected to update this thread. It looks like I already have all of the N64 systems I was expecting to receive from participants, so this will be done in no time at all! When the UltraHDMI kits arrive, I will test each one and update this thread. ROUND 5 is still accepting participants until we reach 40 units. Received the round 4 order of 14 kits a short while ago. I immediately tested all of them. All passed! Right now, I will start packing and sending the kits for participants who are not getting installation. When CZroe gets here tonight, we'll finish all the installations. Not expecting any complications, the round 4 group-buy should wrap-up completely tonight!